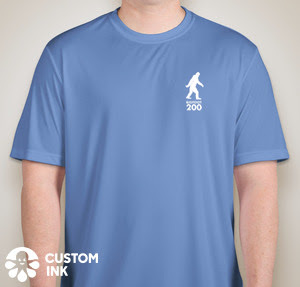 As promised, we’re doing a t-shirt promotion for every $50 donation up until July 8th. 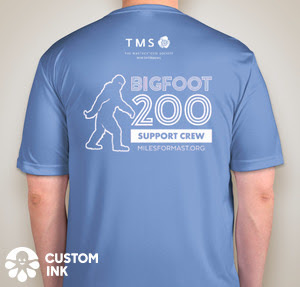 So if you’ve been on the fence, thinking about how you missed out on that 2017 tax break and don’t want to miss again, now’s the time to that donation button and support my effort at Bigfoot 200 and a great charity as well. Here’s the shirt. It’s a technical material so you can wear it while you’re pursuing your own goals this summer and beyond. The training is going well although Sunday was a total bear of a day as compared to the first 9 hour run of the training on Saturday. This was first back-to-back run where I felt like warmed over vomit the entire run. It was just awful. The good is now I’m over 60 total miles for the weekend which really will get the body ready. The run on Sunday was so bad I barely ate anything when I got back except for massive amounts of popcorn when I went to see Infinity War. What A MOVIE…so crazy and so good. Either way the day ended up with me hitting my race weight, 137 on Monday morning. Of course one Costco shopping spree later I’m back up to 140 due to 6 lb. bag of gummy bears I bought. Those things are so addicting. I’ve been eating too many and my tummy has not been happy at all. I’m like a 4 year old and have no self-control. Short but sweet this time with the main emphasis on SWEET as in the deal for a $50 donation.